It's been a really busy week. We have been house hunting and job hunting. Jesse making good use of the curtain tie backs - hmmm - a hat! Not that I can drive it. I have yet to sit my full license because the testers are on strike. 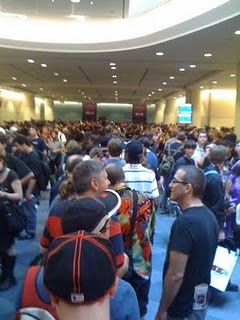 Yesterday we went to the Fan Expo - it was amazing. There were heaps and heaps of people there. We arrived at 9.25am for a 10am opening and there were probably about 1,000 people in the queue already. We had pre-purchased our tickets (smart cookies) so we were inside by just after 10. Waiting in line - Yes there are about 10 lines here - note the people on either side of us are facing the other way, that's because they are ahead or behind us in the queue. Highlight of the day had to be having our photo taken with Leonard Nimmoy (Spock on the original Star Trek). The photo is being posted to us as it was professionally done. Will upload that one when it arrives. All these people in costumes are just the fans, not paid to dress up, they are just very passionate. There was a lot of gory people there but didn't take photos of those people as Jesse was scared of them. There was a car in the food court with a coffin in the back - for some reason that really scared him. Mind you, there was some groaning coming from the back. Jesse went dressed as a Hobbit (what else)! Jenna was Buttercup from the Powerpuff Girls. Jenna, Diana (dressed as an Amine character) and Jesse. Jenna thought that this looked like a nice fellow to take home with her! This Batman took his job very seriously. Mario and - who knows? Andy fulfilled a life long dream to meet Wonder Woman! Getting autograph of Robert McNeil (Tom Paris from Star Trek Voyager). Guess what, his wife's name is Carol too. This chap needs no introduction. Jenna could not resist these Charlie and the Chocolate Factory glasses. That's something to smile about, Jesse. Who you gonna call - Ghostbusters! We just watched this movie last week. How cool is this - Tron is an upcoming remake of that 1980s classic. Jesse's favourite sci-fi series Stargate. These girls looked amazing - note the years. These people were promoting a new Canadian Movie called Rock, Paper Scissors. Only my son could smile like this with three guns pointed at his head. Felt sorry for this guy - he was on his way in and we accosted him for a photo. He had not yet experienced the mania inside and thought we were crazy - oh he's dressed as Mojojojo (evil monkey from the Powerpuff Girls). Gotta say though, best comment of the day had to be when a rather large pirate told me I reminded him of Pink the singer. All in all, a good day was had although by the time we got home about 5.30 we were absolutely exhausted.